Practical Mobile Forensics eBook 50% Off! 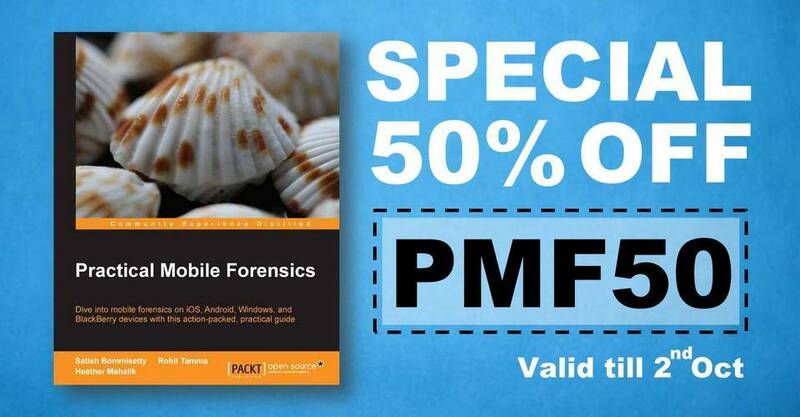 Back by request, here is another coupon code offering 50% off the eBook of Practical Mobile Forensics. This code is only valid until October 2nd and is for the eBook directly from our publisher’s site. To order, click the link below and enter the Discount code prior to checkout. We hope this book helps you get the most bang for your buck in mobile forensics. We aimed to include as many open source solutions as possible to conduct mobile device forensics. Previous PostLE Discount for SANS CoursesNext PostHappy Holidays – Get Practical Mobile Forensics for $5! Hey Heather I am currently taking the FOR585 Adv Smartphone Forensics Course and Loving it. You are a great instructor. But what additional info will I learn in this book? Thanks. Glad to hear that. The book covers more parsing using free methods. Manually creating queries to parse apps, conducting ADB pulls on Android devices and more. It’s a supplement to what you have.